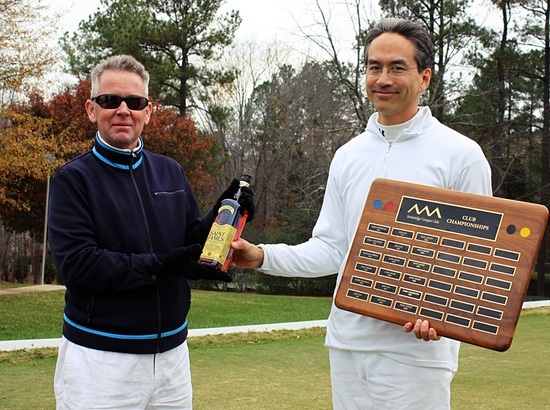 The nineteenth annual Stoneridge Croquet Club Championship concluded November 22nd on the club’s challenging court in Chapel Hill. In the final, current and three-time USCA National Champion Paul Scott succumbed to four-time National Champion Jeff Soo. Eight of the club’s members braved a chilly, windy Sunday morning to participate in what may be the most difficult club championship in the country. In the eight times a Stoneridge player has won the national singles championship, only once has that player won the club championship in the same calendar year. Mack Penwell started this Stoneridge tradition in 1993, when he placed third at the club championship, then won the national title later that year. The most entertaining games came during the double-banked semifinals with all four players stuffing multiple hoops to start the two games. Paul Scott clanked the number one hoop repeatedly, with opponent Andy Short reciprocating. Meanwhile Jeff Soo was having trouble at the number two hoop, leaving opponent Tommy Harrington a couple of free breaks. (In last year’s championship, Harrington knocked out then National Champion Soo and looked well on his way to doing the same against Scott in the final, until he ran into trouble at one of the many difficult hoops.) Both scrappy games went to time with Soo and Scott advancing to the final. The final was largely the razor precise game that one would expect from the two winningest players in recent USCA Championship history. Soo kept both balls out of the game until Scott left a ball on the court, then came in with a drag roll and a long split to approach wicket two, then was off to the races with a clean break and textbook leave. Scott missed the long shot at the balls near the boundary and Soo finished the game 26-5 to win his sixth Club Championship, tying him with club founder Andy Short for the most club wins. The Stoneridge Club celebrated its twentieth anniversary this year. Frank Thompson was tournament director.